However, in my quest to master all things domestic, I think it has become pretty obvious that despite my best intentions, I never quite hit it on the head. But give me a weekend, some amazing sidekicks (what’s up, Mom and Sister-in-Law! ), and an ridiculously crafty wedding-related to-do list, and you can be sure that I will knock your socks off with my enthusiasm. You wouldn’t believe the gorgeous inspiration I picked up and the DIY-mishaps got myself into while enjoying a visit from my adorable mama and my uber-talented sister-in-law Amy. We kicked off the weekends with cupcakes, of course. 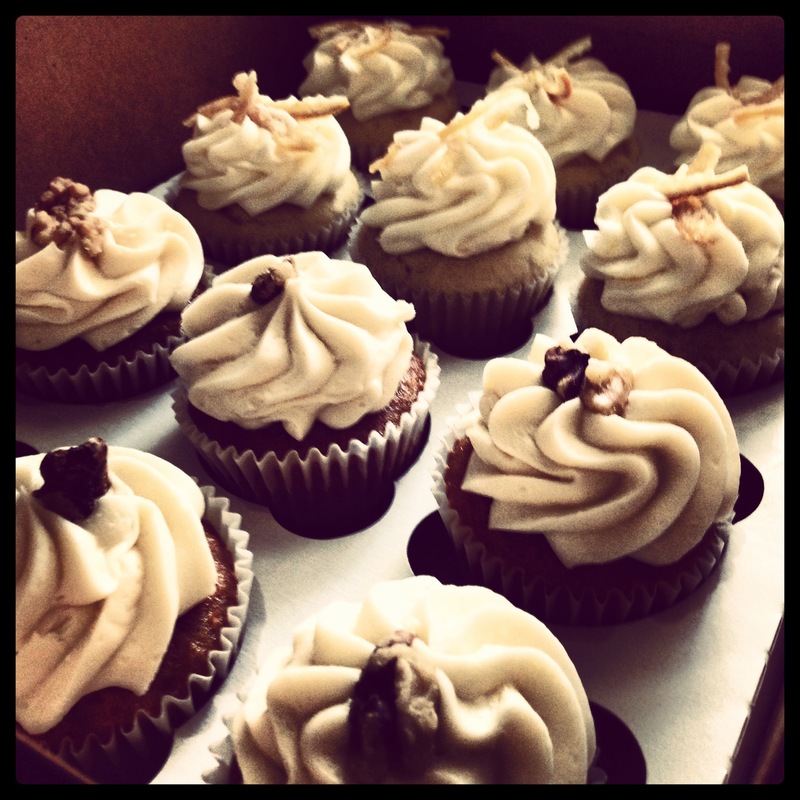 I love trying new flavors from our baker Breanne from SeaBreeze Cupcakes. These are her “24 Carrot” and “Lemon Drop” flavors. One of the highlights of the whole weekend was the result of referral I received from our amazing wedding coordinator Danae Pearce of Danae Grace Events, who recommended that we check out Embellish Vintage Rentals located in Nipomo, CA. The place is a GOLDMINE. 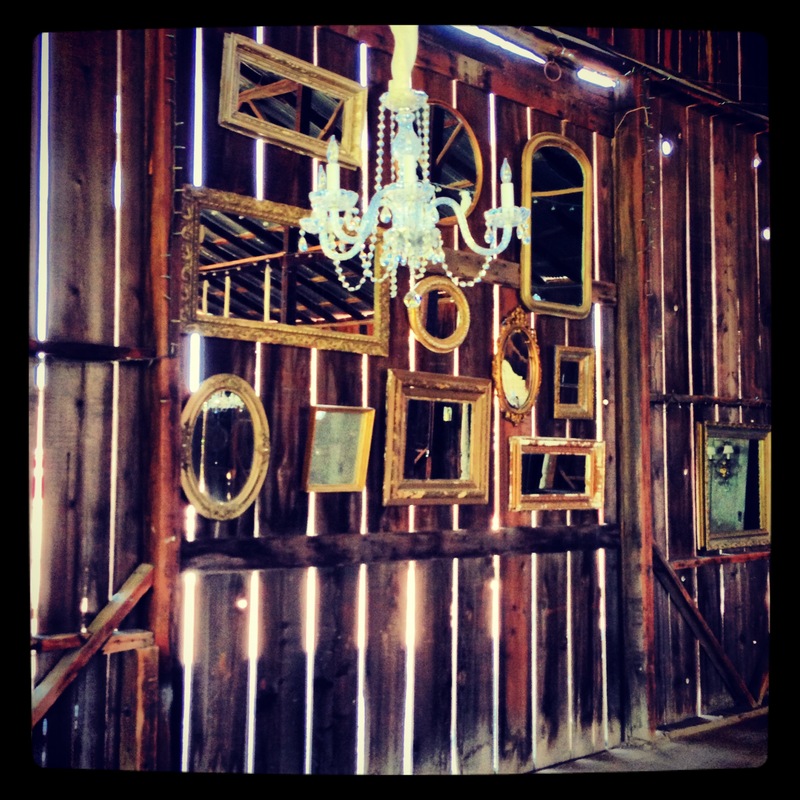 Here are a few snapshots of the beautiful antique and vintage objects available to rent for any special occasion, as well as the breathtaking barn that serves as a drop-dead gorgeous wedding venue. A collection of antique clocks caught my eye! Love the two on either end of the front row. 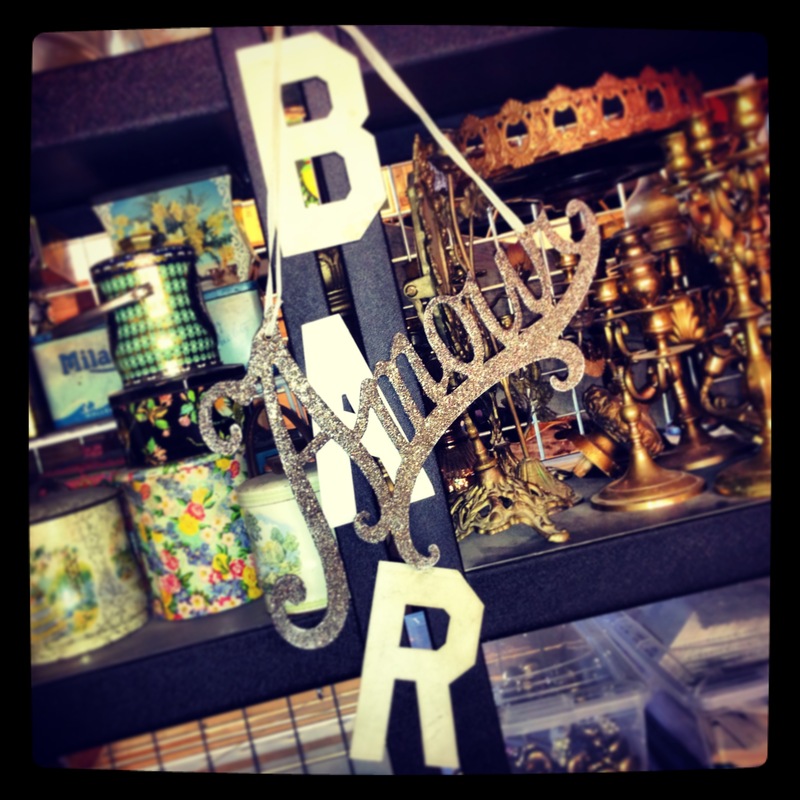 Glitter signs in French, adorable tins, and some glam golden candelabras. Can’t think of much else a girl could need. 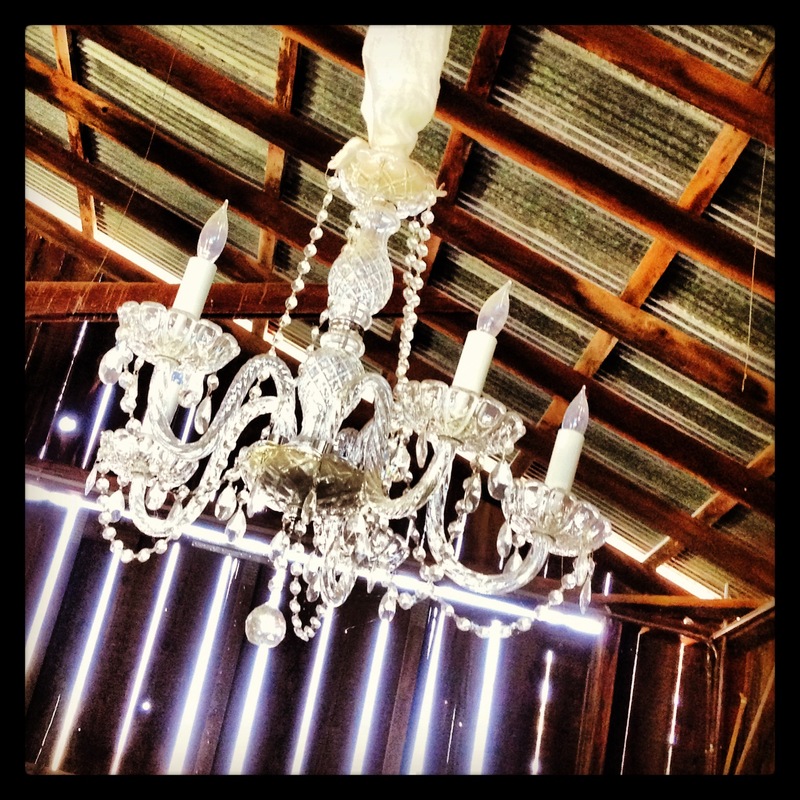 Rustic meets glam. Yes, please. This wall collage of gold mirrors WILL be recreated in my bedroom someday. …and me to pour myself a drink. I’m both overwhelmed to have so many projects to finish and excited to have an excuse to do things like this. If you’d like to participate, I’ll be taking bets on how much of a disaster my good intentions will generate. A few weeks ago, while Bill and I were snagging a rare moment together eating a late afternoon snack at the dining room table, our roommate Emily came downstairs. Now, having been in a graduate program with a strong cohort model (read: every.single.class.together) with Emily AND living with her since September, I know when she’s a little nervous. As opinionated and strong as women come, the tip-off is generally a subtle look on her face and an endearing quiver in her voice. However, at this particular moment, no warning was given as she bolted down the stairs on a mission, sat herself right down at the table, and blurted “Ihavesomethingtotellyou. I’mmovinginwithBen”. Ben is her boyfriend. Girlfriend didn’t even pause for dramatic effect. It took a minute to process what she had just said. Once said processing finally engaged, two emotions went through me. The first was pure excitement and happiness for her, especially after watching their whole relationship spark and take shape over the past year or so. The second, however, was a little crushed. Emily was an awesome roommate. The day we got the idea in our heads was a year prior while writing graduate-level research papers and drinking beers (yes, simultaneously) at her kitchen table, and we realized that we were spending a good amount of time bitching about the exact same pet peeves and irritating behaviors of past/current roommates. I’m pretty sure I’m the one who laughed and said, “Seriously, we should just live together.” She laughed. I laughed again. Insert tentative glances at each other to see if the other was serious or if we were just crazy. She moved in September 3rd. Our wine and chocolate nights, impromptu dinner parties, and compulsive venting sessions are over. I am definitely going to miss her. But it was more than that too. If Emily moved out, Bill and I were faced with a few choices. We could get a new roommate, which seems the exact opposite of desirable two and a half months before our impending nuptials and starting our life together. Or we could try and finagle a way to keep it just us. We opted for the latter, at least for the time being. So we’re trying to make it work financially, which hasn’t been the most stress-free issue inserted into my world, but it’s totally worth it. Now it’s just us. We have started our nest. At the current moment that nest is a giant disaster – really more of a smattering of sticks and twigs we’ve both been collecting in our separate lives until we found each other. It’s cluttered, disheveled, and has no decorating scheme. We have cabinets stuffed to the brim from pre-roommate-evacuation times, and since Tuesday night, we now also have rooms and closets and refrigerator shelves that are stark and 100% empty. 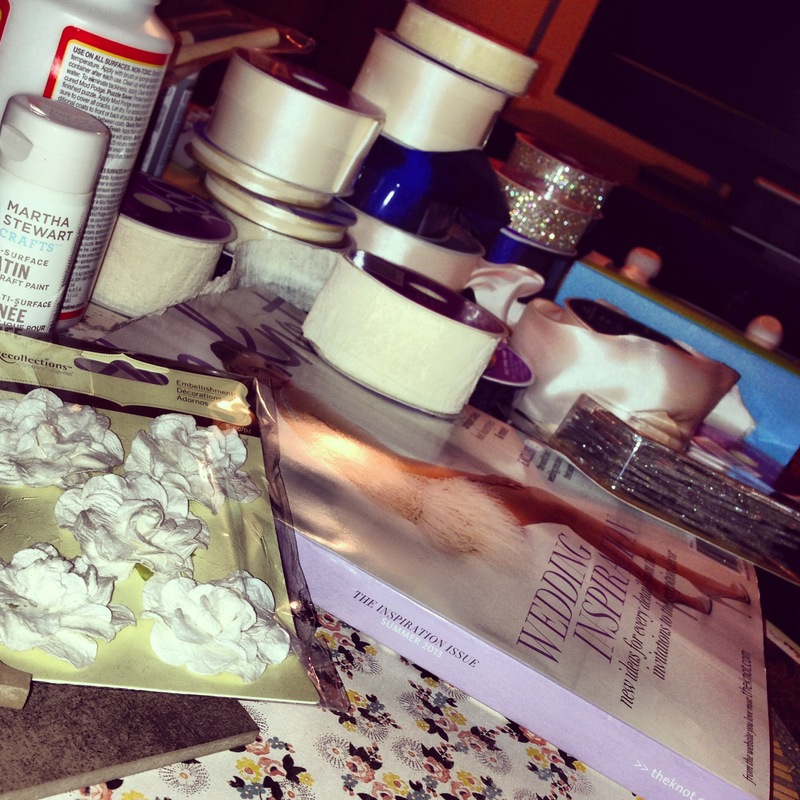 I’m both excited and intimidated to have such a big creative project ahead of me. A WHOLE house. For us. To start our lives together. Slowly but surely, we will begin piecing our sticks and twigs together, with the hopes of it all eventually resembling a nest. Er, home. One of these things is this. Um, wait. There’s another piece to this. Both of these women are tall. And gorgeous. And at least 20 pounds lighter than me. It affected me. I’m not proud of it, but it did. But it also got me thinking about all the other things that have been playing into that lately too. I remember vividly that last summer when coworkers in the student office I was working in heard that I got engaged, it took approximately 43 seconds for someone to ask when I was going to start getting in shape for the wedding. Except the shape I was in was 5’9″ and athletic-yet-curvy, and I thought it was pretty great already. And it has been happening steadily since. 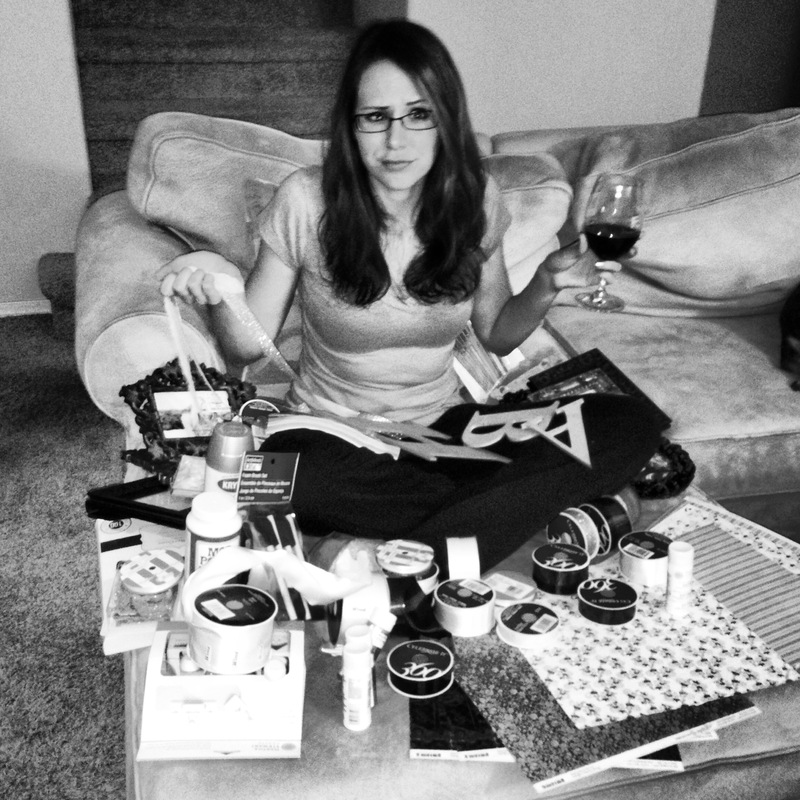 I can’t tell you how many times I’ve heard terms like “bridal boot camp” and “shedding for the wedding”. In fact, last Tuesday I mentioned to someone that I was going to yoga (which I started to help with stress), and her first reaction was “Good for you! Gotta fit into that wedding dress!” Except when I ordered my dress, the lady at the bridal salon asked me in all seriousness if I wanted to order my dress in my size (an 8 in bridal gowns) or in a size 6 or 4. Is that a question she commonly has to ask? Isn’t it my dress? So shouldn’t it be in, well, MY size? I’ve been having a hard time lately. My bachelorette party is in Vegas, which will of course involve days partying by the pool and nights living it up in skin-tight mini dresses. One of my best friends just had a baby, and seeing as how she was a size 0 before she brought that sweet little thing into the world and is well on her way back there, I can guarantee you that she will look “better” than me on that June 1st weekend. And we already know the Beautiful Woman on Right is way smaller than me, and she’ll be there too, not approving of how she looks her her bikini. But now I’ve got it in my head that my bikini has to work 20 lbs harder than her bikini, and it is (and I am) going to be that much less happy about it. All of a sudden, I went from “I can’t wait until my bachelorette party in Vegas” (see Exchange #1 above) to feeling self-conscious and picking apart my body because all eyes are going to be on me – now the biggest girl there. There is an epidemic among girls and women in the country. There is so much pressure for us to look pretty and hot and symmetrical and tan and toned – but not too toned because that’s not attractive – and perfect and cute – but not too cute because that would be creepy. Frankly, lately I would rather look happy. Healthy. Smart. Funny. Caring. Ambitious. Passionate. And while we’re at it, emotional and capable and complex. I would rather look like me. Let’s all work together to make that okay. I bet that’s what it looked like I did for the last two months. That would be entirely… false. Everywhere you look, people are trying to answer the Big Question: How do ​you​ balance it all? I would love to say that after the big ordeal that life has recently become/thrown my way​, I have the answer. Well, the truth is – you guessed it – that thought makes me fall into fits of uncontrollable laughter. Needless to say, that day could not come soon enough. Once it was over, the only remedy was neon and cutoffs, cupcake batter ice cream, a glass of champagne, and my couch. Then at last, the end of the quarter was finally here. Classes were winding down, and it was almost spring break… but the comprehensive exam we have to pass (in place of a thesis) in order to get our Master’s degree was taking place just two weeks into the new quarter. I got some traveling in during that week, but with Comps right around the corner, studying was a cloud hanging over all that fun. The quarter started, and finally came our Comps Day on Friday, which takes the form of a five-hour exam that consists of lengthy essays (I wrote 21 pages, APA-format, during that time), and I was done. Just done. I spent last weekend sleeping. Recovering. Letting the outside world come rushing back in. I got some drinks to celebrate and started feeling a tiny bit better, but for some reason I haven’t been able to shake the weight and the stress of everything that has happened in the last four months. I’ve missed writing, cooking, exercising, reading, listening to music, planning the wedding, seeing my friends, EVERYTHING. I found myself starting to worry and get anxious again… until I was driving to work/school one morning and realized that that was silly. I have put so much time and energy into trying to control things and make everything perfect, and while I have been doing all that, the world has been passing me by. I kept finding myself wishing that everything would slow down. That I could just catch a break. That something would let up. So many huge life events are happening right now: graduating, getting married, starting a new job. How AM I going to balance it all? There’s just no way, right? But then I realized just that: there is no way to balance it all. Life will throw what it wants at you. It doesn’t matter how hard you work at trying to keep it all together. But if your heart and your mind are open, all of these crazy, frustrating, overwhelming days can turn into exciting, unpredictable, beautiful ones. 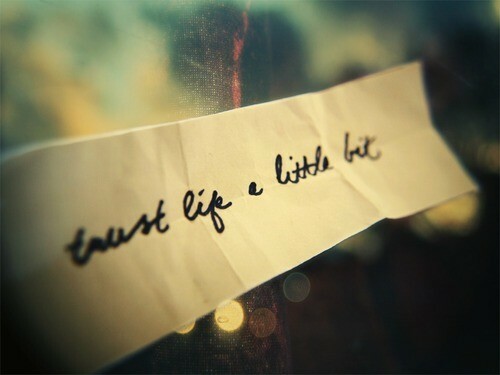 It really is amazing how that happens… once you decide just to trust life a little bit. This is going to be a struggle, adopting this new outlook. But I want to be done stressing. I want to be done being frustrated. I want to be done with my excuses and my complaints and my constant frustrations. I have to phase all that out. I need exciting, unpredictable, beautiful days. So here I am. I’m planting a smile on my face. NOW. I’m putting my sunnies on. And I’m going to enjoy this life, d​amnit.